The Taoiseach, Bertie Ahern, has set Thursday May 24th as the date for the general election in the 26 Counties. Sinn Féin’s 26-County TDs today said that they are preparing for the election of a significant number of colleagues in the forthcoming General Election - with the aim of the party being in government north and south of the border. DUP leader Ian Paisley and the 26-County Taoiseach, Bertie Ahern, will visit the site of the Battle of the Boyne together next month, it has been confirmed. A political representative of the UVF has said unionist paramilitaries will wait to see whether power-sharing between Sinn Féin and the DUP succeeds before decommissioning their weapons. Former IRA prisoner Martina Anderson, who will be one of three Sinn Féin nominees to the newly-constituted Policing Board, has said she will be going in to hold the PSNI to account. Sinn Féin TD Martin Ferris was arrested on suspicion of drink-driving at the weekend, the party has confirmed. Mayo farmer Willie Corduff, who was jailed for three months in 2005 over his opposition to Shell’s inland gas refinery at Rossport and high-pressure pipeline through his farm, has been awarded the world’s most prestigious environmental prize. Two members of the British Crown forces are involved in the latest intelligence gathering operation to obtain the personal data of over 150 nationalists from the PSNI police computer system and deliver it to a unionist paramilitary death-squad. Sinn Féin President Gerry Adams has said his party is set to take up its positions on the Policing Board following a first ever meeting with the controversial body. Sinn Féin has dismissed accusations that it is negotiating a deal with the DUP to allow the Protestant Orange Order march through the nationalist Garvaghy Road in Portadown. The DUP leader Ian Paisley has stated that he will see out the full four-year term of the Belfast Assembly as First Minister, despite the initial understanding that he would resign within the first two years. A British government document has described unionist murder gangs as voluntary organisations in the same bracket as children’s charities. The 26-County Minister for Justice, Michael McDowell, has refused to allow a jailed IRA Volunteer temporary release to sit a college entrance exam. Sinn Féin has challenged unionist paramilitaries in the North to come clean following the discovery of a new hit list of republican murder targets. A number of Catholic families whose loved ones were murdered in the 1990s have asked the Police Ombudmsman’s office to investigate the role of self-confessed RUC/PSNI Special Branch agent Stephen ‘Inch’ McFerran in some twenty killings. Trouble broke out in Derry after a heavy PSNI presence turned out to monitor an Easter commemoration organised by the 32 County Sovereignty Movement. The British army and MI5 military intelligence shredded files on collusion returned by the Stevens Inquiry, it has been confirmed. The Provisional IRA has apologised to the family of a republican killed by its members 17 years ago. A new cross-border agreement travel scheme has come into effect, giving senior Irish citizens unlimited use of bus and rail services and other transport services throughout Ireland. The countdown to a united Ireland is underway, according to Sinn Féin’s Martin McGuinness. Sinn Féin political adviser Breandan Mac Cionnaith has resigned from the party without commenting on the reasons for his departure. A primed mortar rocket was defused in County Armagh and two other bombs were made safe in County Tyrone amid signs of increasing activity by republican militarists. The Dublin government has denied that it is trying to cover up the truth about the 1974 Dublin and Monaghan bombings, in which 33 civilians died. A Catholic bus driver who endured half a decade of sectarian harassment and intimidation at work said the ordeal has “ruined his life”. The deal between Sinn Féin and the DUP marks a significant triumph for US foreign policy, senior congressmen said in Belfast on Sunday. The annual Easter statements issued by the main republican groups. 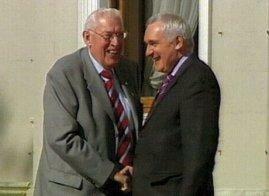 Extraordinary scenes continued in the peace process this week with a public handshake at Farmleigh House in Dublin between DUP leader Ian Paisley and the 26-County Taoiseach, Bertie Ahern. Survivors and the bereaved of the 1974 Dublin and Monaghan bombings have vowed to continue their battle for justice after a report by criminal lawyer Patrick MacEntee failed to provide significant new information. A leader of the unionist paramilitary UDA has ruled out weapons decommissioning, claiming loyalists still “feel threatened”. Demolition of the perimeter wall of the infamous H-Blocks has begun, marking a final end to Long Kesh’s function as a prison and the first phase in the construction of a new multi-function development on the site. Sinn Fein has confirmed its team of ministers for the Belfast executive. Emma Groves, a west Belfast woman who became a major factor in the campaign against plastic bullets after being blinded 35 years ago, has died.